One of the best parts of dairy farming, at least for me, is naming all of the new babies that are born. Now, I don't name them all – it's oftentimes a joint effort between me, Glen, and the kids. The inspiration for each of the names can come from many places. I wrote a column a couple years ago about the process, so I won't go into detail here. 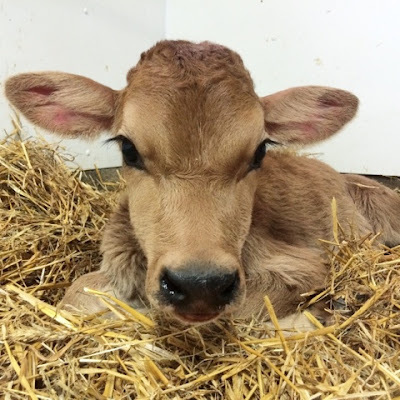 But I will say that the one rule we normally follow is that the calf's name starts with the same letter as her mother's name; that way it's easier to remember down the road which cows belong to which cow families. Here are all of the names we picked for our baby calves in 2014, followed by the calf's mother's name. We broke tradition a couple times this year to name calves after some of the special guests who visited our farm this summer. UPDATE: Our Baby Calf Names of 2015 are now published.